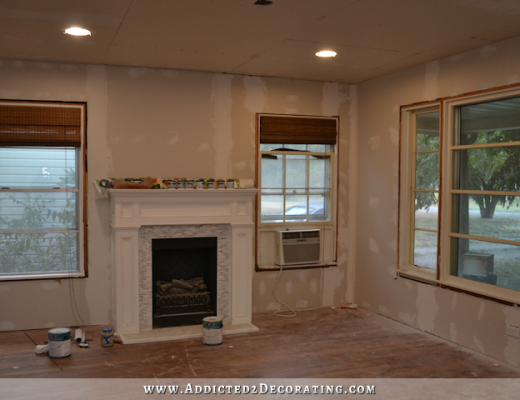 I spent most of yesterday in the music room working on the Roman shades for my dining room windows, and as I was working, I kept glancing into the entryway and dining room and making a mental list of all of the projects that still need to be done before I can call those areas finished. My floors are done but still curing. The Roman shades are in progress. 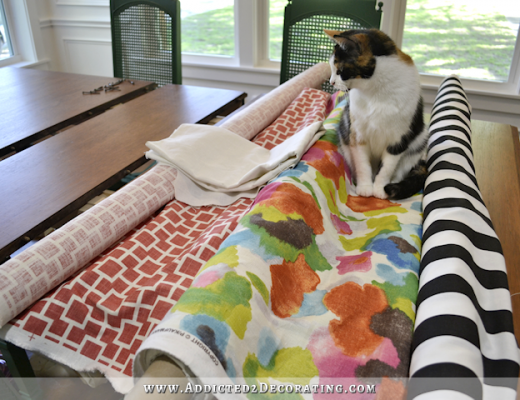 I have all of the fabric and supplies for my side dining chairs, except for the monogrammed pieces (which I still need to send to the embroidery company). 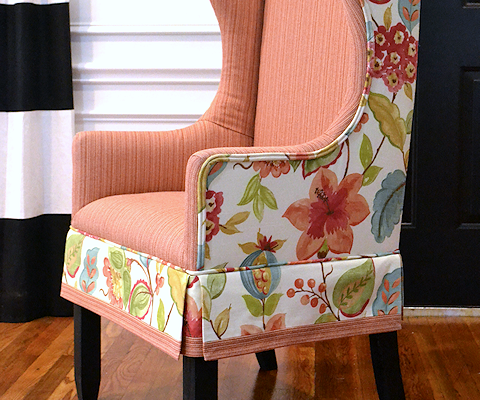 And I still want to build two host dining chairs. But another thing the room needs is new artwork for above the fireplace. I love my mom’s painting, and I’ll definitely use it somewhere else in the house. But I think that particular spot — on a white backdrop and between black and white draperies — needs something bold, vibrant, and colorful. So last night, I got on Pinterest and starting looking at DIY artwork for ideas. Nothing really impressed me. Most of the time, DIY artwork on Pinterest looks…well…like DIY artwork. That’s not quite what I had in mind. I kept searching. My absolute favorite kind of artwork is abstract, but I don’t like anything linear or geometric. 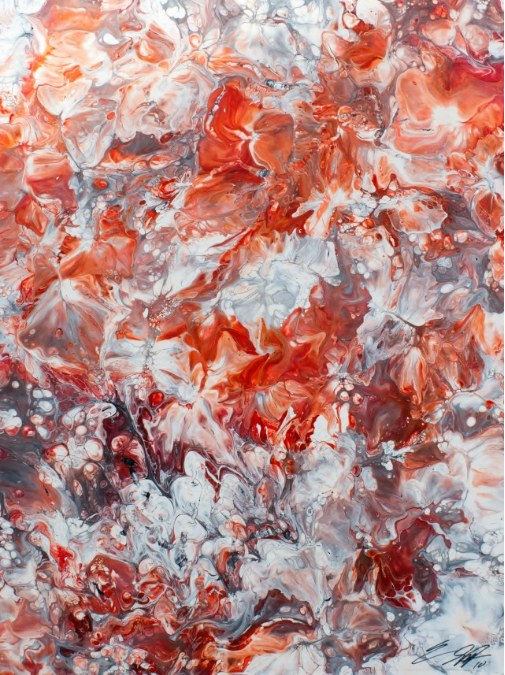 I prefer loads of freeform color and movement, with the colors melding together in a marbled effect. And as I kept looking and searching, I came across the work of Emma Lindström. Somehow, Emma manages to take all of those things that I love — vibrant colors marbled together in lots of movement like an explosion of life — and put them on canvas. Oh, what I would give for the knowledge and talent to be able to do that!! Her Facebook page and Instagram account are feasts for the eyes. *Sigh* I want to be able to do this! 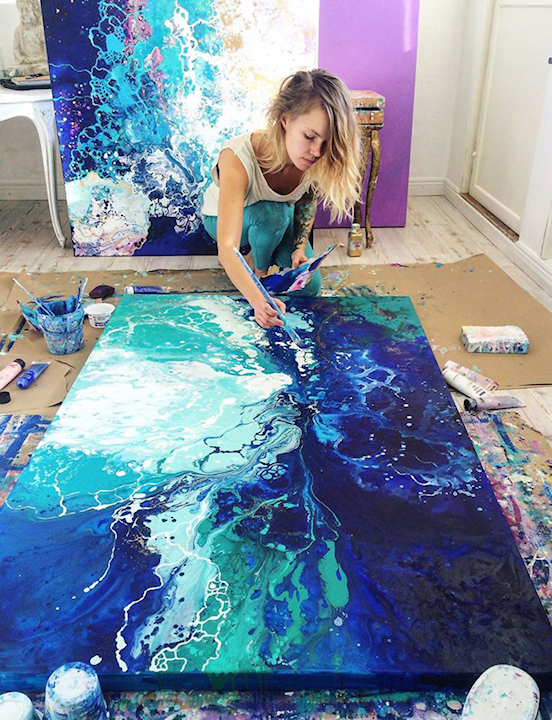 I’d pay money just to be able to sit in a corner of her studio and watch her work for one full day just so I could learn the technique. I did get an idea of the process by watching some YouTube videos of liquid acrylic painting. I’m sure I could do some version of it, but I think learning how to get all of that intricate detail takes quite a bit of time, talent, patience, and a really honed artistic eye. And from there, I somehow got lost in the world of Eric Siebenthal. Eric has a YouTube channel where he shares his process, and I sat in front of my computer completely mesmerized last night as I watched video after video after video. He uses liquid acrylics squirted from ketchup bottles, and then uses an air compressor attachment to blow air onto the paint to move the paint around and get the marbled effect. It’s so fascinating to watch! Eric’s work, which you can also see on his Instagram, definitely has an edgier look, while Emma’s has a softer, watery look to it, but I like them both. …I was pleased with how it turned out, but I had no idea what I was doing. 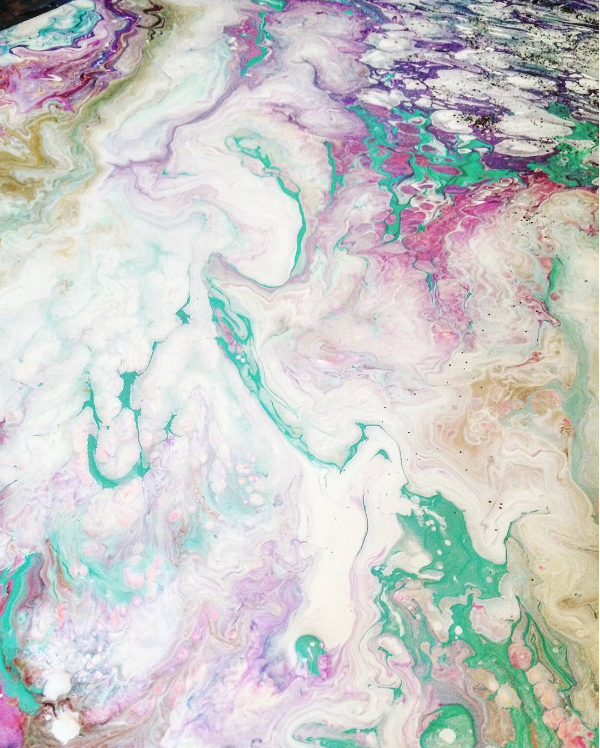 I didn’t know of any other techniques for getting that marbled look other than actual marbling (where you float paints on top of water and swirl them around, and then place the paper on top), and just painting with a brush directly on a canvas. I have a friend from High School that does this, more like Emma’s work. She is very talented. I am going to send her your FB page and maybe you can see her works also. She is very reasonable. Would you mind sharing her facebook page with us? I’d be interested in seeing more artwork like this. If this link doesn’t work, search Leslie Fox Fulton, MO on Facebook. 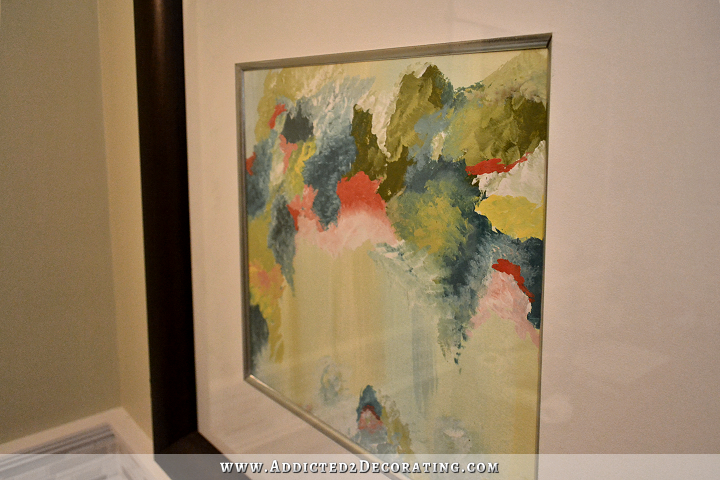 I’m not a fan of abstract artwork, however, I’m sure you will use it in your room and make it work and look fabulous. Looking forward to seeing it! I too am in love with the style in Emma’s work. I’ve fallen in love with a few paintings from Z Gallerie, but I can’t bring myself to purchase them. Apart from being manufactured and knowing thousands of other people having the same work. I really want original art that I can say “I did that!”. We have a local artist in Portland, Oregon named Buzz Siler. He’s best known for paintings of women, but his style is very similar. Here’s a video of him demonstrating his technique. Check out Brittany Lee Art on Facebook. 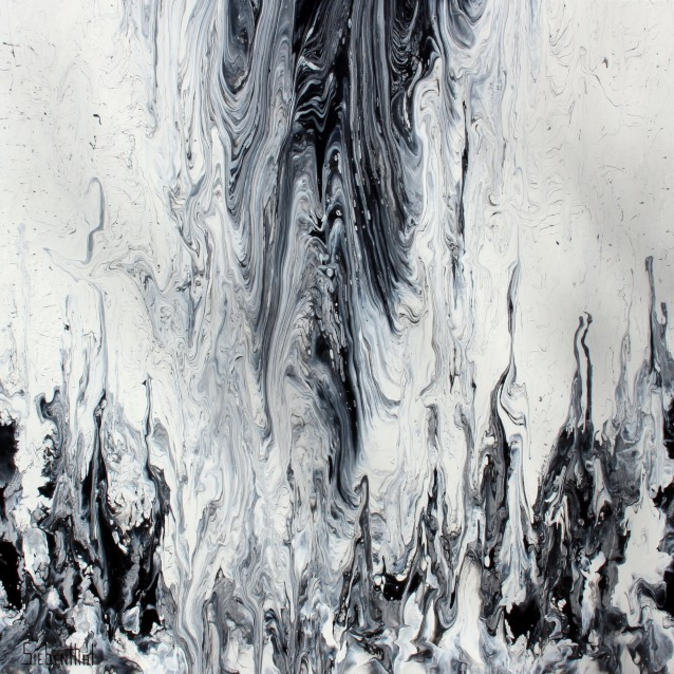 She does abstracts which are to die for!!! She’s a Louisiana gal but has her works displayed in Austin. 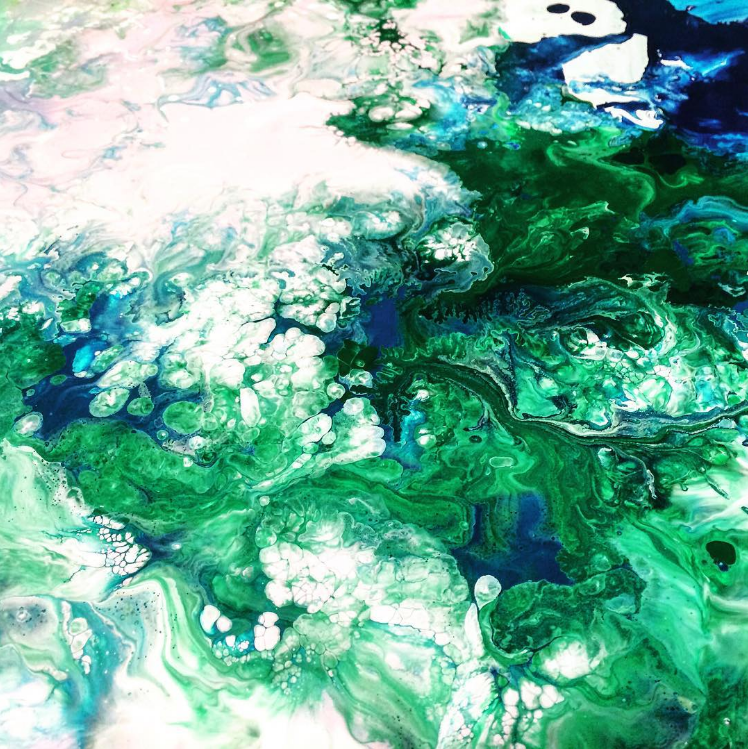 That blue and green picture by Emma Lindstrom looks like a picture of the earth from space. Very pretty. If Erin’s friend can do you something similar that would be great but the link doesn’t seem to be working. Oh shoot. I will have her get on here later. She was at work. Woww! I love this! Thanks for sharing, Micele! The main thing to remember is that all works of art both abstract and representational must have balance, harmony, contrast, scale and emphasis which would be your focal point. If one of those is missing the work is not complete. There is a reason that it is pleasing to your eye. The trained artist’s eye can see what a piece is lacking and knows how to rectify it. Abstract art can be very deceiving as it has the appearance of being in the moment and haphazard when it takes a trained eye to know how and where to proceed to achieve that look. Just as a designer knows when something is amiss in a room design, and artist knows when an element is missing or off in a painting. I’m sure you can relate to that. Fortunately, I am able, as an artist, to visualize both rooms and paintings. When there is no focal point or too many focal points or no balance or harmony, it sort of makes me crazy until it all balances. Wow. I never thought about it that way. Well you learn something new every day, they say. But I still don’t generally love abstract art. I don’t know anything about art, but I know what I like. I’m a huge fan of “if you love it, buy it”… So…. Hope you find just what you love! Emma paint. I laughed because most of us reading your blog feel that way about your work. I’m no artist, but I was going to suggest the water method (and then you mentioned it). Perhaps your base could be that (let it dry completely) and then you could add detail to the top with brushes or other tools. You might also want to look into techniques involving painting with palate knives, which lets you pile-up goopy paint to give it texture or spread it around like frosting. I want to say one of the PBS TV artists used to do that…maybe the guy who trained Bob Ross? Bill Alexander? Another thought was reverse-glass or plexi. Didn’t you do a project awhile back that you didn’t end-up using that involved painting on the back of a piece of glass? I recall that looking watery. I wonder if you could use reverse-glass painting techniques of inking, then painting the fine detail on the glass first, then covering the whole mess with a watered-down paint to give a watery background. None of this is my style, but I think it’s cool to look at techniques that are outside the box! Can’t wait to see what you come up with. So this may be crazy but have you ever seen shaving cream art? It’s big among kid art circles. It makes beautiful designs and could inspire a grown up version. I was wondering if anyone was going to mention Unicorn Spit, my niece just did a table for me, I will post it when she sends the pictures. You may some more inspiration here https://www.facebook.com/JValentineFineArt/photos – a cousin of a cousin of mine. I like Emma’s work for your house. So talented! Very cool painting style! It reminds me so much of Jackson Pollock’s drip work, and I love the piece you created!! I think art is what you make it, and what you made is beautiful Kristi! I would be interested in creating a similar piece myself, how long did it take for you to paint it? Thank you! I think it just took an hour or so. 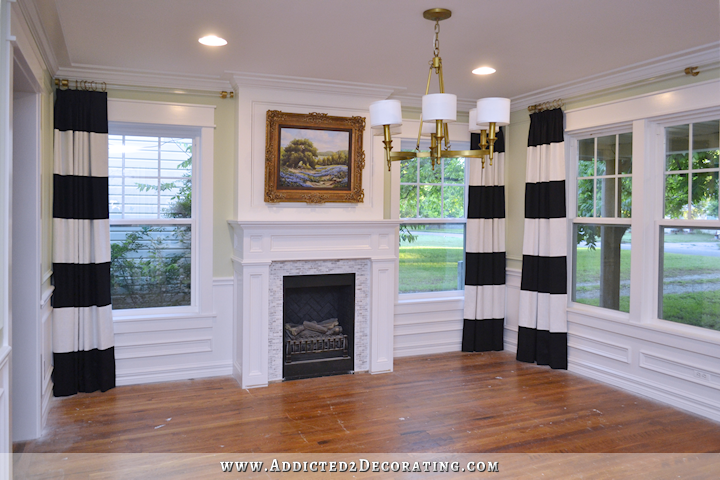 You ARE an artist..your canvas is your home and your medium..the furniture, paint, projects u do…u truly r an artist..any good interior designer is..